More than [show] business is a collaborative project between CCA – Centre for Contemporary Art and Post–Museum. This collaboration is conceived as a platform for exploring different curatorial formats and ways of presenting and distributing art. We are looking for proposals from individuals and groups who will use the space as a platform for cultural production and activity. How can a space be inhabited? How can a space respond to multiple uses, shift identity and open up to different forms of engagement? How can a space produce context? How can one negotiate with the inherent restrictions in using an institutional space within a temporary framework? How open is an open space? Proposals will be selected on a basis of how to use a space in a generative and critical nature. Please send us your ideas and proposals at admin@post-museum.org! We embrace various formats for activities. Proposals of a maximum of 500 words due on 4 July 2014. Proposals will be selected on the basis of content, practicality and feasibility. The selected proposals will unfold throughout July, August and September. The Post-PopUp is hosted within one of the CCA artists’ studios as a site for events, happenings, artistic experiments, hanging out and spontaneity. The programme will unfold in several episodes, bringing together institutional, curatorial and artistic gestures. 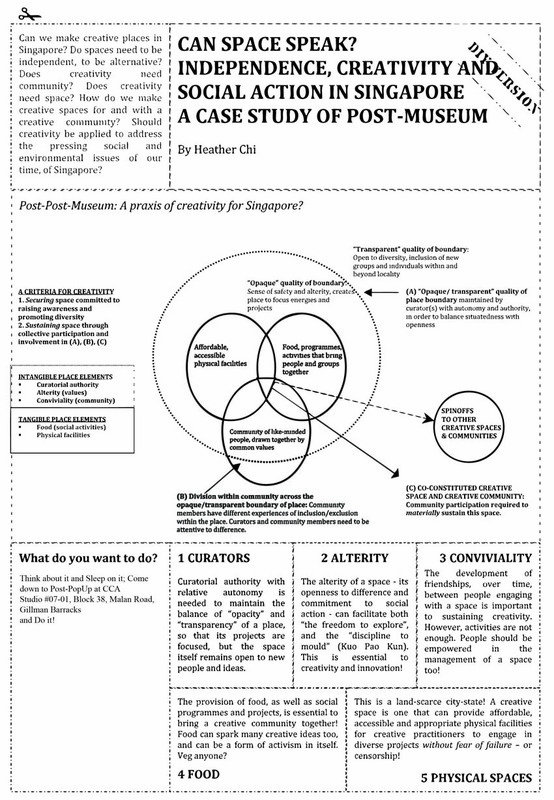 More than [show] business is a space that could be tested for a future of co-constituted creative spaces and artistic communities in Singapore, looking at institution building in tandem with artistic practice. Going beyond exhibition making as artistic output, More than [show] business at Post-PopUp at CCA invites those to engage with other aspects involved in artistic production, the discursive event, the community group and the overnight show. The project More than [show] business – Post-PopUp at CCA is a collaborative effort between Post-Museum and CCA, led by curators Anca Rujoiu and Vera Mey, with the additional support of the National Arts Council (NAC).